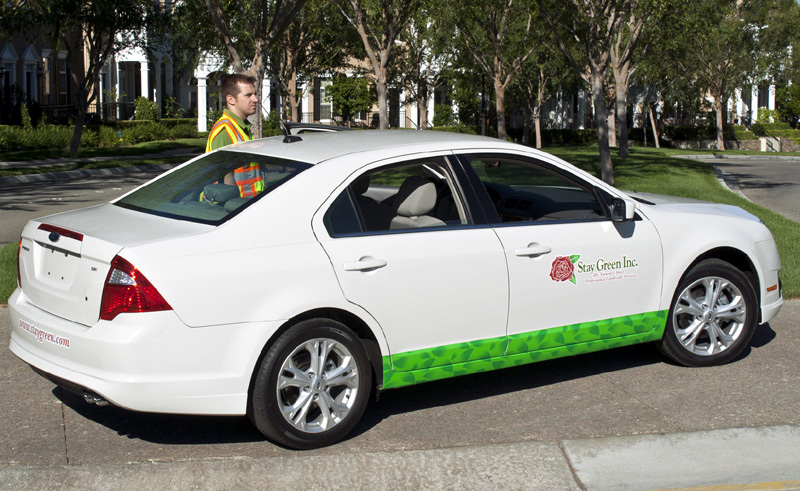 Stay Green Inc. walks the walk when it comes to sustainability — and now the award-winning landscaping company is driving the drive, too, by replacing higher-mileage pickup trucks with fuel-efficient Ford Fusions. Working in cooperation with Enterprise Fleet Management, a full-service fleet management company for businesses with medium-sized fleets, Stay Green has replaced 10 of its 2-year-old pickup trucks with gas-sipping Fusions. It’s estimated that, based on an average of 25,000 miles per year per vehicle, Stay Green is reducing those vehicles’ carbon footprint by 50 percent. Angelo added that the new Fusions are not only better for the environment, but also reduce operating expenses, including fuel costs. “Lowering our own operating expenses helps us keep our prices as competitive as possible for our clients, which is important in maintaining our industry-best 95 percent customer retention rate,” Angelo said. Stay Green’s 300-member team provides award-winning landscape management services to homeowners associations, property management firms, businesses, municipalities and golf courses throughout Southern California. While the traditional notion of a landscape company vehicle might include a pickup truck — and of course, some trucks are still needed to haul equipment and so forth — many transportation functions, including mobility for account managers and other personnel, can be accomplished with more fuel-efficient, “right-sized” vehicles such as the Fusions provided by Enterprise Fleet Management. According to Enterprise, it’s important for businesses that operate fleets of vehicles to perform regular vehicle maintenance, examine driving routes to maximize efficiency, and develop a cycling plan to replace vehicles at appropriate intervals, thus maximizing the fleet’s fuel efficiency. Angelo said Stay Green is operating its fleet with all of these things in mind, and more.